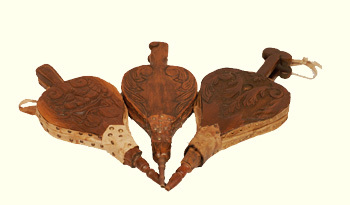 Fireplace Bellows - A set of three classic bellows (shown above) are simple in design, and fully functional with aged custom fit leather. We offer leather in just about any color. 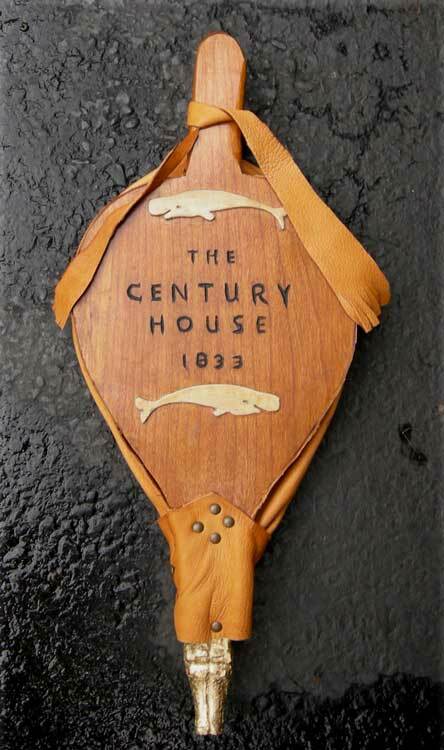 Paul Revere is credited with the style of bellows common in every colonial home; bellows were a very useful tool for getting a smoldering or banked fire back to flames. 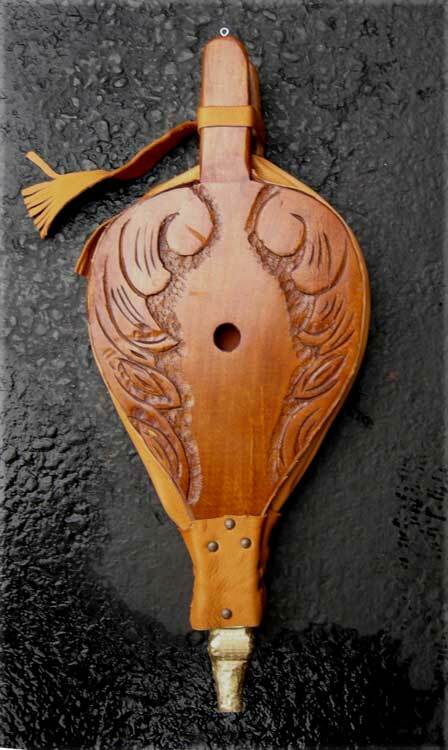 Bellows extend with the imagination, they fit original personalities and themes for a fireplace in any room. This Viking or wood spirit face bellows is a reproduction of a family heirloom bellows passed down through the generations of our client's family. 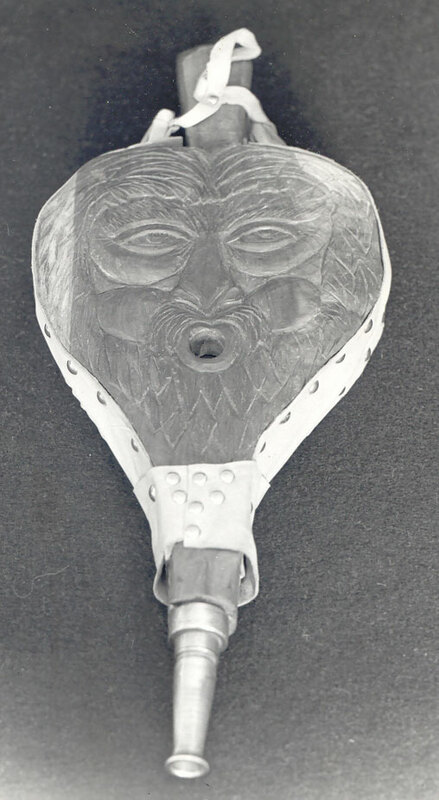 The piece includes a full face carving on the front side of the bellows, aged leather, brass tacks, and a custom made snake tip. 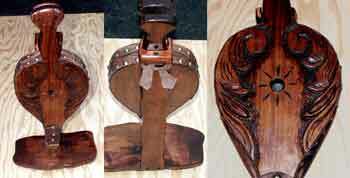 The tip is the work of the Blacksmith of Trenton, designed as close as possible to the original bellows tip. This piece shows an example of how combinations of trades applies to a variety of product options. 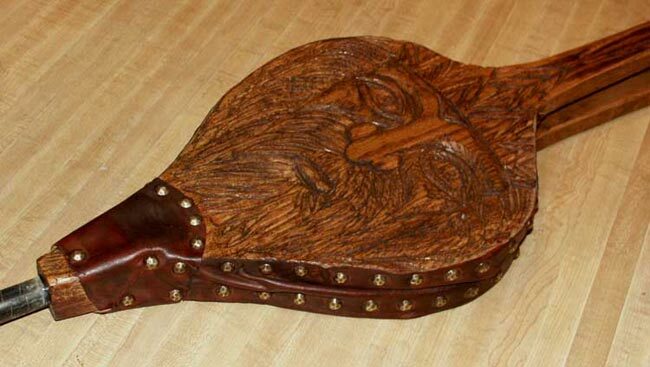 If you have a bellows you like, we'd be happy to take a look and see if we can match it or we offer our own original designs both decorated, carved, or stenciled. 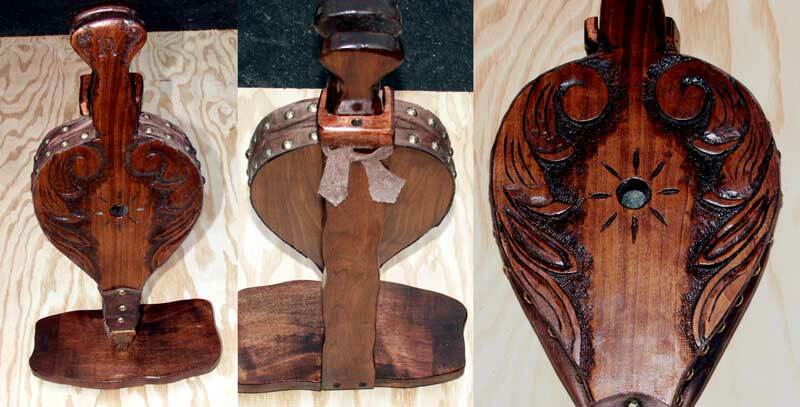 This solid cherry bellows was fit to a matching stand and customized with a family initial on the handle and a unique carved dragon head nozzle. Dragons are one possible theme, we've done bears, dogs, snakes, and other such creatures as well as classic brass or turned wooden nozzles. 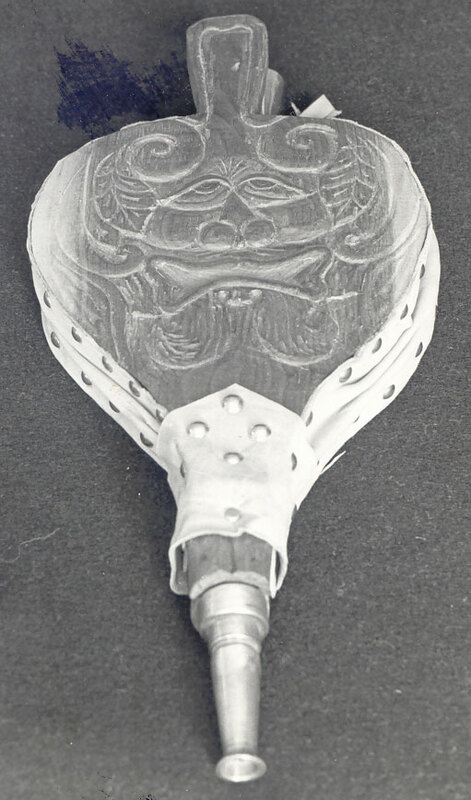 Dolphin appliques and inscriptions are another option shown left on this solid cherry bellows. 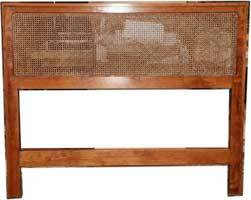 This unique piece is a solid 8/4" cherry headboard. Simple in form it makes its mark without being obtrusive. 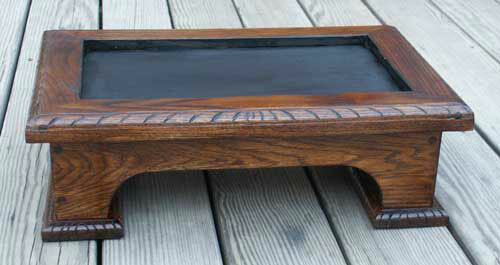 Pressed 1/4" caning fills the upper panel for texture without weighting down the minimalist form. 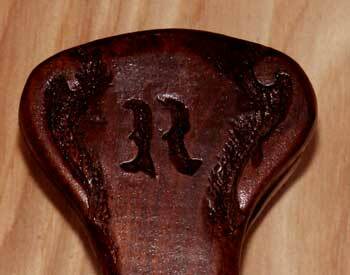 Footstools - Once and a while we get a request for a footstool, this particular piece was designed to match our 2002 Portfolio piece, a Gothic Credence table in finish and carving pattern. 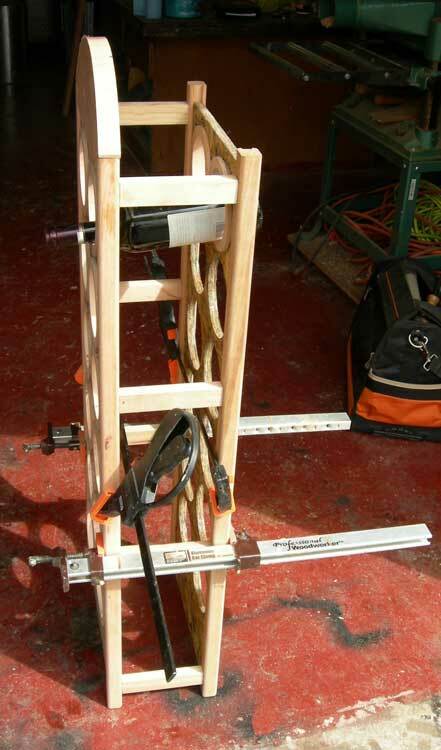 We also offer library step ladders. This low profile piece simply gives a slight boost to those speaking at a church lectern. The center section will be carpeted for non slip footing for the finishing touch. 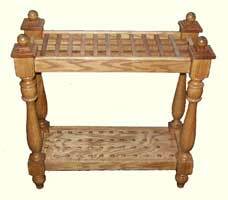 We can design various footstools, library ladders, or other assorted pieces to suit your specific d�cor. 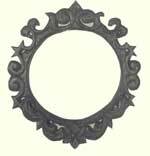 These beautiful wall mirrors came in many sizes and shapes. They may be ordered in larger sizes and in oval or rectangular shapes. Other period mirrors may be ordered by special commission. You never really see cane racks anymore, yet there was a time when they were a feature of every restaurant, club, bar, parlor, office ... anywhere gentleman would gather. The cane rack went out of fashion with the cane ... which makes sense why have a place to put something nobody needs to keep anywhere? The fact is though, these grid style racks are great for displaying collections of canes, they can be configured for fishing poles, guns, golf clubs maybe? 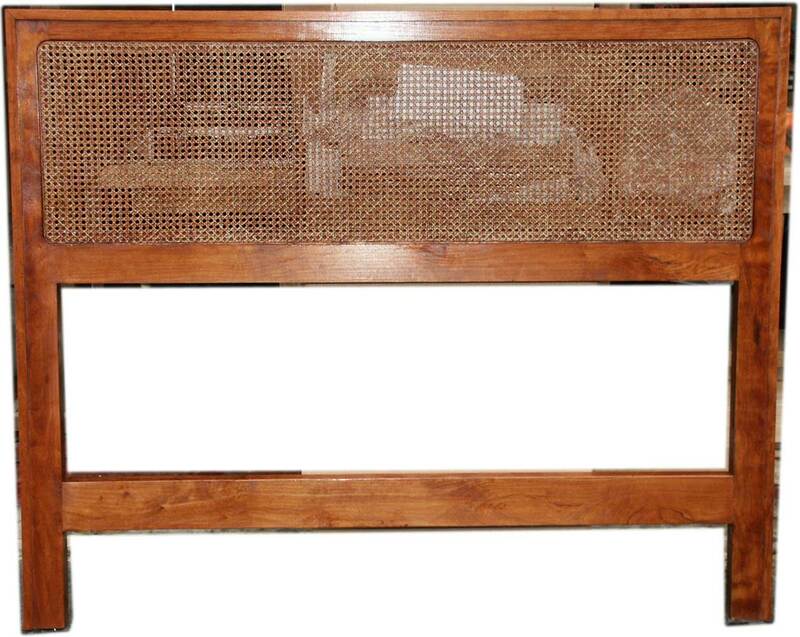 Anything that is long and thin could be stored in a rack. 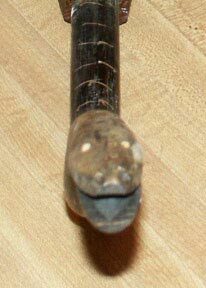 If you're a cane collector, or walking stick fanatic be sure to also check our spin-off website www.customwalkingsticks.com for an extensive variety of custom personalized canes, walking sticks, and hiking staffs. 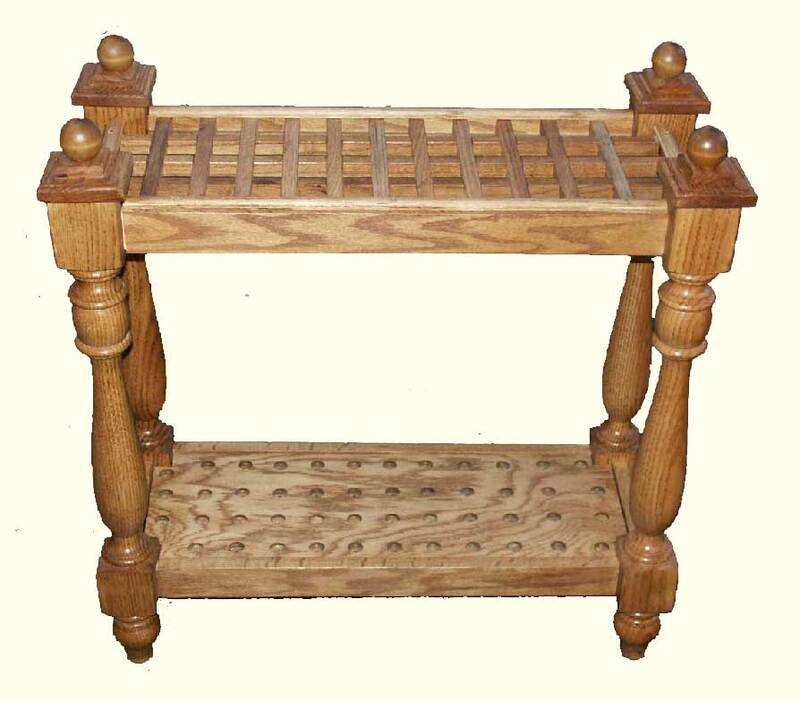 This oak bench has hand shaved spindles - each painstakingly hand fit into the railings and bench seat. We don't often make these, but on occasion if we're asked nicely we do give in! 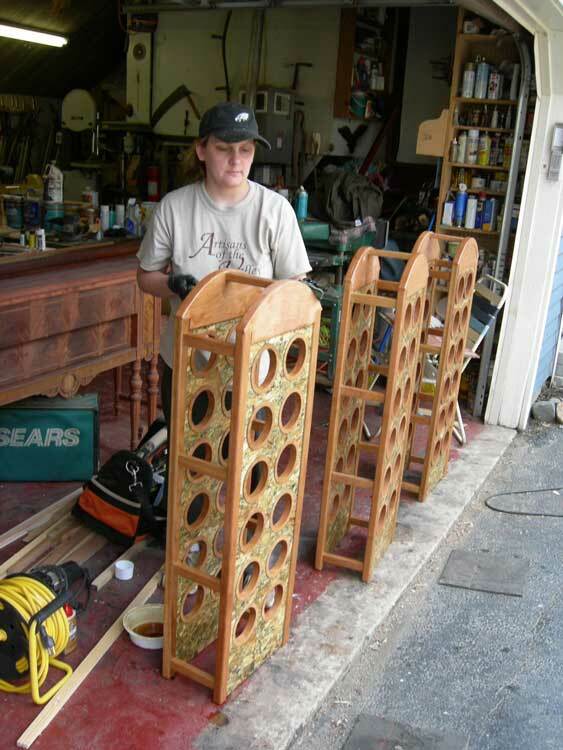 Custom OSB Wine Racks - This project was unique in that it utilized a colored flake OSB as the primary material. 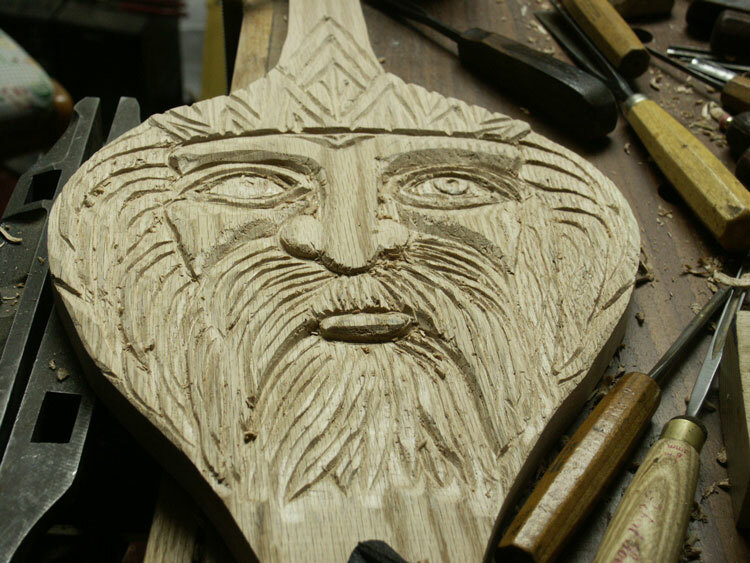 The project was commissioned by a company that manufactures this product, and these pieces were offered to retiring board members. 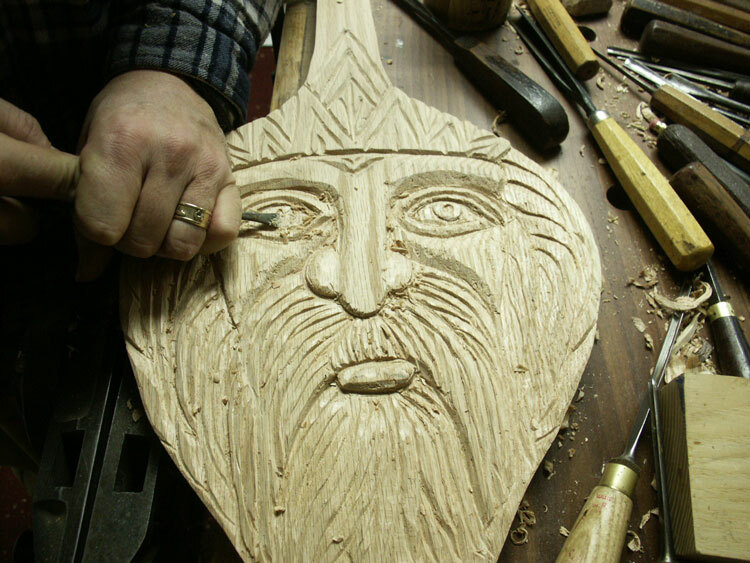 Artisans doesn't normally work in OSB, but we took this on for fun to see what we could do. The combination of solid cherry and the stand board actually turned up to create an interesting contrast and a rather stable wine rack!